Diesel not runing as good as it used to? Maybe just a simple injection flush is all you need. This will help remove carbon deposits and contamination in the fuel system to help get the power and mileage back into your diesel. 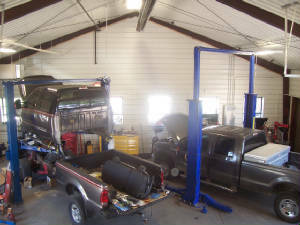 We proudly use BG products in our shop for all your diesel service needs. These chemicals are not a "mechanic in a can," but used with regular service they can help prevent the need for costly repairs later.